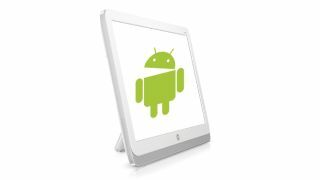 HP has claimed victory in the race to build the world's first all-in-one (AiO) desktop PC running on the Android 4.2 Jelly Bean operating system. The Slate21 is essentially a super sized tablet with a kickstand, which reminds us of another recently unveiled AiO (in terms of pearly white looks, anyway). It features a 21.5-inch 1920x1080 pixel resolution IPS touchscreen that HP claims provides wide viewing angles and vivid graphics. The company is positioning the Slate21 as a consumption device with simple operation for families seeking entertainment features, such as TV streaming and apps from Android's ecosystem. It will, however, allow you to access, share, edit and print content from various Google services such as a calendars, email, notes and documents. HP says the Slate21 will feature 'dual band technology', which allows users to stream music or movies and browse the web at the same time. The machine comes pre-installed with an HP TrueVision HD Webcan and Wireless Direct, which allows users to share videos, phones and data in the absense of an Internet connection. It's powered by NVIDIA's Tegra 4 quad-core NVIDIA processor, which will lend it the chops to deal with graphically demanding apps. The Slate21 is set to land in the UK on 1 October and will be available from HP's website and UK retail partners at a starting point of £369.